The London 2012 Olympics were the first Games with a legacy plan already in execution well before the beginning of the event. This study aims at evaluating the legacies of this Olympic edition, with particular regard to the new public open spaces created and their sustainability. The research carries out a post-occupancy evaluation of the Queen Elizabeth Olympic Park, which is the main output of the 2012 Summer Olympics. Results show good achievements in terms of physical and social integration while the economic impact appears to be the weakest legacy from hosting the Games. Mega-events, from the Olympics to the World Cups, are often regarded by planners and politicians as key drivers for the overall redevelopment of a city (Azzali 2017; Malfas et al. 2004). Mega-events have driven the urban transformation of cities such as Barcelona, London, Rio, Beijing, and Shanghai, but while the prospect of economic growth is the driving force for hosting a major event, the legacies that follow their hosting have been difficult to design and quantify (Preuss 2007). In particular, past experiences show that outcomes from staging major events are mostly harmful, and their legacies planned to last only a short time. This trend is even stronger when looking on how sports facilities and their surroundings are utilized after the event is over. Usually, sports venues become white elephants, and their neighborhoods islands of placelessness (Relph 1976): underutilized and abandoned pieces of the city. In 2005, London was chosen as the 2012 Olympic city, beating Paris, Moscow, Madrid, and New York, after four rounds of voting (IOC 2015; IOC 2017). For the first time in the history of Olympics, the British capital was the first hosting city with a comprehensive legacy plan that was already in execution before the staging of the Games (Chappelet 2008). Indeed, in 2003, the Olympic Committee amended its charter to include an additional statement in its mission that focused on the generation of beneficial legacies for hosting cities. Since 2003, all bidding cities are required to have a legacy plan in their candidacy files, explaining post event usage for sports facilities and long-term plans for the areas involved in the Games (Chappelet 2008). The 2012 Olympics were staged in London from 27th July to 12th August 2012, allowing the capital to become the first city to have hosted the Games for three editions: in 1908, 1948, and 2012. After the closing ceremony, in Fall 2012, the Olympic Park, the main legacy left from staging the Games, was closed to be transformed into the legacy mode, and fully reopened in April 2014 (Queen Elizabeth Olympic Park 2015; Queen Elizabeth Olympic Park 2016) . 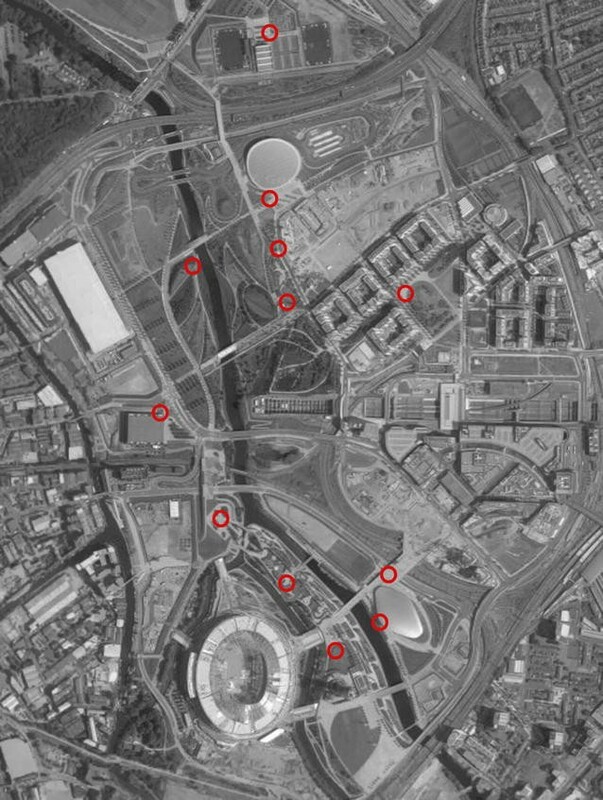 Within this context, this work aims at evaluating the real sustainable legacies of the London 2012 Olympic Park after the reopening of the area and assessing its social, economic, environmental, physical, and governance-related impacts, by performing a post-occupancy evaluation of the area. Methods for the appraisal include the development of a City and space card tool, as well as a series of site visits and interviews with experts. Also, this methodology allows measuring the effectiveness of sports events in providing public, liveable, and sustainable open spaces. Findings are helpful for future hosting cities and event-governing bodies, as they can lead to the definition of strategies for maximizing the benefits from staging mega sports events, and defining guidelines for implementing and delivering effective long-term sustainable open spaces from event sites. Although mega sports events as Olympics or World Cups have a strong impact on the local communities and the built environment, the planning of their legacies is a relative new concept for both the academia and organizing committees, and is often defined as “all planned and unplanned, positive and negative, intangible and tangible structures created by and for a sport event that remain for a longer time than the event itself” (Preuss 2007, 86). A milestone was unlocked in end of 2002, when the IOC, the International Olympic Committee, organized an international congress on the ‘Legacy of the Olympic Games from 1984 to 2000’, with the aim to define all the potential strengths and pitfalls in the planning and management of legacies in the long run (Leopkey and Parent 2012). The 2002 IOC Congress attempted at defining legacy. However, it is only since 2003 that legacies were formally included within the Olympic agenda, since when all bidding cities have been required to have a legacy plan in their candidacy files, in which they have to declare how they intend to utilise event facilities in the long run (Chappelet 2008). Since its origin, legacy has changed its definition from an idea reflecting a general impact related with the staging of a mega-event to something that is intentionally and proactively designed to be long lasting and sustainable. A part from legacy’s definition, a complex and unsolved issue is the creation of an effective and comprehensive framework for the evaluation and the planning of sports events legacies. Moreover, an effective tool should be able to evaluate legacies within a long-term time, and applicable to different geographical areas and contexts. To solve this issue, the IOC developed the OGI (Olympic Games Impact), a tool that evaluates legacies based on data collected from a hundred and fifty indicators derived from three main dimensions (environmental, economic, and social). Data are collected for twelve years (IOC 2006). The OGI was introduced on the occasion of the 2002 Salt Lake Games, and, nowadays, it is considered a strategic element for transferring the Olympic knowledge (IOC 2006). However, OGI has limitations. Firstly, all the indicators used by this tool collect quantitative data and do not include either qualitative data, or soft and intangible legacies. Moreover, the data collection stops only two years after the conclusion of the Games, when the Local Organising Committee (LOGOC) ends its life. In addition, if the Olympic Movement attempted to tackle this problem, FIFA and other major events organizers are far behind. In fact, although other events such as the Expos (Dimanche 1996), or minor sports events as the Commonwealth Games (inter alia: Smith and Fox 2007; Matheson 2010; Nichols and Ralston 2012), or World Cups (i.e. Preuss 2007; Cornelissen et al. 2011) have been explored, research is now focusing mainly on the Olympics’ impacts (Gold and Gold 2008; Cashman 2006; Ritchie 2000; Girginov 2011). Additionally, looking at the literature, the majority of the academic works did not undertake any comprehensive approach and investigated only one main impact at a time, usually the economic aspect (i.e., Burgan and Mules 1992; Preuss 2005; Gratton et al. 2009; Allmers and Maennig 2009; Crompton 1995), the image-related impact on hosting cities (Richards and Wilson 2004; Zhang and Zhao 2009), or the social outcomes (i.e., Waitt 2003; Raco 2004; Smith 2009). Other studies have also investigated other types of legacy, such the environmental issues (i.e., Chappelet 2008; Levett 2004; Collins et al. 2009), or the impact on urban development (i.e., Pillay et al. 2009; Pillay and Bass 2008; Liao and Pitts 2006). Frey et al. (2008) focused their research on the impacts on local development, while Essex and Chalkley (2015) explored how to leverage sports events for urban regeneration and renewal purposes. In the last years, hosting cities have started including concepts of sustainability and sustainable development to their legacy plans, mainly to justify the expenditure of taxpayers’ money in the mega-events’ planning and execution (Smith 2009). Finally, Preuss (2007) underlined that there are three main issues researchers need to face when assessing legacies: the difference between gross and net legacy, the assessment of legacies over-time, the decisions concerning the positive and negative contributions of legacies. However, in spite of how legacy is measured or defined, it is difficult to find accurate studies on how to transform event sites, as Olympic parks or stadiums surroundings, in liveable and sustainable public spaces. Cities are increasingly interested in bidding and hosting mega-events, and it has become strategic to implement strategies that allow maximizing the benefits from their stage, and planning and implementing positive, sustainable and long-lasting legacies. The adopted methodology is multi-layered and composed of a mix of different methods. The case of London, and more specifically the Queen Elizabeth Olympic Park, which constitutes the main legacy after the stage of the 2012 Olympic games, was analysed according to a threefold data collection. Firstly, an analysis of the official documentation, and, in particular, the bid book, the post-event report, and the London Plan, which is the city master plan, was conducted. This process allowed identifying the sustainable legacy goals and real achievements. Then, empirical methods, and, in particular, site visits and direct observations were performed. Finally, a set of face-to-face semi-structured interviews with experts was conducted. The first step in analysing the case of London consisted of a pre-analysis investigation. Drawing on data from the literature review (among others: Girginov 2011; Gold and Gold 2008; Raco 2004; Raco and Tunney 2010; Smith 2014; Thornley 2012; Watt 2013) and existing documentation (i.e., websites on the topic, the bid book and the London Plan), a basic knowledge was acquired, especially regarding London local governance and the 2012 Olympics management policies. A tool was utilized for the collection of these data; it is called City and space card (Fig. 1). The tool helped in the collection of useful information both on the city of London and the selected space. In particular, data about city governance structure, alignment with the master plan, but also dimensions, typology and function of the city and the space were collected. The tool granted focusing on the most relevant data and having a big picture of the space analysed, and it helped in defining both the observation points of the site visits and the interview guide (Table 1). Between February and November 2015, a series of site visits were performed at the Queen Elizabeth Olympic Park in Stratford. The methods utilized, partially derived and adapted from Wiedmann et al. (2012) and Salama and Azzali (2015), included behavioural mapping, direct observations, and walking through analysis, with the aim to collect data and information about the built and natural environment, people and activities performed in the park, and in particular, the following data were gathered. Flows: how many people (numbers), going where (directions: from–to). Activities: people doing what (sport, cycling, walking, running, playing, chatting, resting, eating, working), and for how long. Demographics and ethnicity (equitability): Males vs. females, young vs. adults, singles vs. families, and locals vs. tourists; regarding ethnic background: prevalence of white, black, Asian, or Indian people. Safety and security: the presence of cameras and gates; lighting; quality of the maintenance. Comfort and accessibility: availability and quality of street furniture and shelters, signage and of maps and information, cafés and toilets. The quality of cleaning; accessibility for disables, elderly, kids; the presence of pedestrians and cycle paths. Attractiveness and pleasantness: general appearance/aesthetics, presence of landmarks, quality of the landscape, the variety of activities provided, weather conditions (weather conditions were noted to evaluate how activities and people varied according to season’s and weather’s changes). Firstly, a set of 12 points within the park was selected (Fig. 2). These points were selected because they are particularly meaningful spaces and the most popular areas within the park. Indeed, they are access points to sport venues, main park entrance, main play areas, and spaces outside the most popular coffee shops. Secondly, a series of site visits in different time and days of the week were scheduled and carried out (Table 2). Each visit consisted of a tour through the selected points. The average length of the tour was about 4 h, with a stop of 15 min at each point to collect relevant information, and 5 min to move to the next point. Starting and ending time/points was inverted every day to cover all the time slots in all the points. Two tours were repeated daily. At the end of the site visits, I also conducted very informal interviews and chatted with people frequenting the park to collect additional data on the activities performed, main venues and spaces utilized within the park, and time of access. The aim of these visits was mainly to analyse the physical and social components of the space. For collecting the data, two specific tools (a behavioural map, as per Fig. 3, and a space assessment checklist) were created. The main set of observations and behavioural studies was conducted in August 2015. Additional observations were performed in February, April, May, June, July, September, and November 2015, to compare the data collected with different weather conditions and times of the year. Private sector (planners, architects, and engineers belonging to major private organizations involved in the planning of the Games). The interviews, all in English, had a length of around 1 h each, and they covered three main areas: a personal definition of legacy, with particular reference to time and beneficiaries; personal experience and role held for the preparation of the event, with the identification of best and worst practices, pitfalls and achievements of the 2012 London Olympics; personal opinion on how different hosting cities (i.e. developing vs. developed cities) and different sport events (i.e. Olympics vs. World Cups) can achieve and/or promote beneficial long-lasting and sustainable legacies. The same interview guide was utilized during all the interviews. It contained 14 open-ended questions. The guide was sent by e-mail few days before the interview, to let the experts be more comfortable and prepared for the discussion. The interviews were recorded with the permission of the interviewees, and then answers were transcribed, coded and divided into similar themes and subthemes to compare and analyse them, with the aim of mapping the main issues, best practices, pitfalls and strengths. This methodology allowed acquiring information especially on the governance, management, and planning. Also, the involvement of several experts belonging to different fields was useful to avoid bias in the collection and analysis of the data. In 2005, London was awarded the 2012 Summer Olympics, becoming the first city ever to host three editions of the Games, in 1908, 1948, and 2012 (IOC 2015). The 2012 Olympics were planned to use a mix of new venues, and existing or temporary facilities, some of them in well-known locations such as Horse Guards Parade or Hyde Park. To avoid some of the problems that plagued previous events and facilities in the city, the intention was to prevent the proliferation of white elephants after the Games (Queen Elizabeth Olympic Park 2015). Some of the new facilities were planned to be reused in their original form while others were designed to be reduced in size or dismantled. The main goal to achieve through the Games was to regenerate Stratford in East London, the site of the Olympic Park, and the surrounding areas. Stratford is located in the borough of Newham, which is situated 8 km east of the centre of London, and is north of the River Thames. According to estimates of that period (Greater London Authority 2005), Newham, a borough with an overall population of 333,000 inhabitants, had one of the highest ethnic minority populations of all the districts in the country (Table 2), and its regeneration would have helped in the process of convergence identified by the local master plan (the London plan), providing East London with the same opportunities of the wealthy West London. Indeed, during the twentieth century, Stratford was the scene of protests and riots due to the high rates of unemployment and crime. When in July 2005 the International Olympic Committee announced that London would host the 2012 Olympic Games, it was decided to make Stratford the main centre of the Olympics: the area had great potential because it was already an important transport node in London. Due to this choice, a complete redevelopment and reconstruction of the demolished industrial area along the banks of the Lea river was achieved. The majority of venues for the 2012 Olympiads were located in three areas within Greater London: the River, the Central, and the Olympic Zones. The Olympic Zone, now Queen Elizabeth Olympic Park, is the area that faced the major change and regeneration for the Games, and consisted of 75 ha of inaccessible and unattractive land transformed into a new park. The park, located in East London, provides a public space serving London and the local community, and it was renamed as the Queen Elizabeth II Olympic Park to commemorate the Diamond Jubilee of Elizabeth II. It is just next to the Westfield Stratford City development and includes many sports facilities and the former Olympic Village. The park was closed just after the Games, in the end of 2012, to be transformed into the legacy mode. It reopened partially in July 2013, and fully in April 2014. 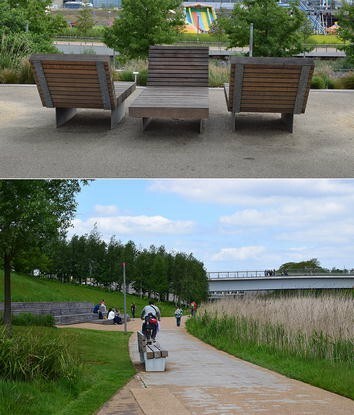 The park covers parts of Bow, Stratford, Hackney Wick, and Leyton, overlooking the A12 road. This area was developed on existing waste and industrial land. Indeed, before the Games, the site was a mix of brownfield and greenfield land. The London Aquatics centre, an indoor venue composed of a 25-m diving pool and two 50-m swimming pools, and designed by Zaha Hadid. The Olympic stadium, designed by Populous, and reduced to 54,000 from the original 80,000 seats after the Games. After the re-opening in 2016, it will be used by West Ham United Football Club and British Athletics. The Copper Box, an indoor arena, designed by MAKE Architects. During the Games was a complex for handball and goal ball competitions, and it is now utilized as a multi-use venue. The Lee Valley VeloPark, designed by Hopkins Architects, which is a cycling centre with a velodrome and BMX racing track. Eton Manor, also known as Lee Valley Hockey and Tennis Centre, designed by Stanton Williams. It is composed of two hockey pitches and ten tennis courts, four indoor and six outdoors. Although the sports facilities were either temporary or dismantled after the end of the Games, part of the legacy promises was to guarantee the full use of the permanent venues for international events but also by local communities. Examples are the 2015 European Hockey Championships and the 2017 World Athletic Championships. The observations conducted through the site visits showed the park is overall attractive and pleasant. It was fully reopened in 2014, so it is still new and well maintained. The park has two main and several minor access points, although the one from Stratford is the more utilized and connected (it provides trains, DLR, over ground, metro, and bus lines connections, but also a major parking area for cars). As long as easily accessible, the area is completely accessible for disabled and for people with reduced mobility, and, near the information point, golf cars and strollers are available for rent. The park is multi-modal, as it can be visited on foot, by bicycle and even by boat, through the main small rivers and canals that cross it. The Southern area comprises the aquatics centre, the Olympic stadium, and the Orbit, artwork by Anish Kapoor. This is the most easily accessible area, through Stratford. Thanks also to the proximity to the Westfield City Shopping centre, this area is the most vibrant space within the park, and the most frequented. In addition, the area provides a multi-purpose area that is utilized for concerts or temporary activities. During Summer 2015, a temporary fun fair was set up, attracting many families and children. The North area includes three major sports facilities (the velodrome, the tennis and hockey centre, and, at the side, the Copper Box) and it stands by the River Lea with its waterways, paths, and extensive green space. This area of the park is quieter and attended mostly by runners and cyclists, or athletes accessing the facilities. As an open space, the park is subject to weather conditions, but also to schools calendar and working hours. During spring and fall, the space and aquatic centre are utilized by schoolchildren. During the summer, schools are closed, and when students and children are on holiday, the park is highly frequented by local communities, especially families and moms with children. Only a few shelters are available, so, by contrast, low temperatures, dark, and wind discourage to access it. As Table 3 shows, data collected from the behavioural maps confirmed that the park is mostly used during spring and summer, and in the central hours of the day. Indeed, families with young children enjoy the play areas, and, in particular, water fountains, while sportsmen enjoy running and cycling. The overall park is well maintained and clean, and, as some site visits highlighted, during weekdays, one can frequently see workers in charge of the maintenance, including the green management. Street furniture and cafés are available through out the area, in particular seating, as benches and chairs (Fig. 4). The landscape is also well maintained, with a wide variety of vegetation, play areas, fountains and water features. Some landmarks art works are also located within the park. Comfort and accessibility are provided in all the points observed. There are many pedestrians and cycle paths. Cafés, drinking waters, toilets, free Wi-Fi are also available, especially in the South area. There is a main information point near the Stratford entrance, open daily, where to find maps and gadgets, and organize guided tours. Signage and information maps also available in every corner of the park, to ease way finding. Safety and security are also provided, with the presence of CCTV cameras, lights, and also some policemen. The park is open 24 h a day, but it has fences and gates that can be closed in case of necessity. Regarding people and flows, the data collected from the behavioural mapping sheets showed that the park is more utilized by young families, moms and children, and athletes. The North and South areas offer different insights. Indeed, while the South area, especially near the Information point and the stadium, is popular with families and children, the North area, except the Timber Lodge café and its playground area, sees more athletes (runners and cyclists). International tourists are also increasingly visiting the space, and, every week, even during the winter, two guided tours of 2 h each are organized at the information point. The activities provided are different; however, the park is mostly utilized for recreational purposes. It provides two main playground areas, but also some water features that are mainly used by children. During the summer time, especially during the weekends, groups of people enjoy visiting the park for a stroll or a picnic, or for relaxing and resting. Between June and September, many additional activities and events are held for families and young people. The space offers direct access to sports facilities as the aquatic centre or the velodrome, but it is also equipped with pedestrian and cycle paths. With consideration to flows, what emerged from the observations, is that the park is most frequented during weekends and in the middle of the day, between 11 a.m. and 4 p.m. Regarding demographics, the majority of users are local young mothers with their children, and athletes. During the weekdays, schoolchildren also visit the park. During the weekends, the typologies of visitors increase, including more adults, singles, and tourists. Finally, regarding ethnicity and equitability, it is worth to remember that the Newham is one of the most ethnically diverse boroughs of London. This diversity is well represented by the park’s visitors. Among the five sports venues in the park, the aquatics centre is the most utilized, especially in the afternoon and weekends. It is open every day from 6 a.m. to 10 p.m., and it provides a 50 m swimming pool for adult swimmers, and another one for kids. The velodrome and its outdoor BMX and mountain bikes tracks are also frequented, being the only cycling centre in London. The Olympic stadium was closed and under renovation at the time of the observations. It was partially reopen for the rugby world cup in October 2015, and it fully reopened in the end of 2016 with a capacity of 54,000. It is now the long-term home of West Ham United Football Club and British Athletics. The Lee Valley Hockey and Tennis Centre is only partially utilized, especially during weekends and in the middle of the day. It also hosts major international events, as the EuroHockey Championships, organised in August 2015. The park is open 24/7 and access is free. The sports venues are managed by social enterprises and are accessible to local communities and tourists. However, a ticket is required to access the aquatic centre, the velodrome, and the tennis centre. With reference to the term legacy, although legacy is usually indented as anything left after the event, the majority of the interviewees underlined that more than giving a standardised definition, it is important to set and define realistic objectives and long-term goals, and to have a strong vision. The political context is also an important element for achieving a positive and successful legacy. Indeed, hosting cities need political stability, strong leadership, and clear vision, but also the capability to plan and deliver long-term projects. While a mega-event usually lasts two or three weeks, legacies are durable, they last for more than a generation, for 30–40 years. Legacies need to be planned carefully. This strategy includes balancing temporary and permanent infrastructure and considering not only the physical impact but also the social side. In the case of London, this included a strong focus on integration and convergence, with the aim of providing all Londoners the same opportunities, and fill the gap between the rich West and East London. Some of the experts also suggested a flipped approach, in which first to plan what will happen after the event and then adapt the event to the legacy requirements. To illustrate, in the case of the 2012 Games, London strongly needed a new aquatics complex, because the city had very few public swimming pools. So, a new aquatics centre was built for the Games, but thinking about legacy. The venue has now a capacity of 2500 seats with an additional 1000 seats available for major events; however, during the Games, two temporary wings were added to increase the capacity to 17,500 seats, which is the IOC requirement. The wings have now been removed to avoid white elephants. Regarding the case of London, some achievements and pitfalls can be highlighted. Firstly, the city introduced the concept of early legacy planning. Indeed, the city established both a plan (i.e. the Legacy Plan) and a public body (i.e. LLDC, London Legacy Development Corporation) in charge of legacy well before the stage of the Olympics. Secondly, there was a strong synergy between the London Plan, the city’s strategic plan, and the bid book. To illustrate, one of the objectives of the London Plan is to reduce the imbalance between the West and East side of London, and the choice of locating the Olympic Park and Village in Stratford, East London, aimed at accelerating this convergence. In this sense, the Games were intended as a means for creating jobs and work opportunities, and training and education programs for local communities were developed before the Games. The major focus was on regeneration, not only physical, but also social (convergence), to allow Londoners to have all the same opportunities and reduce the gap with the wealthier West London. From a physical point of view, before the Games, the Olympic site was a complex area, very disaggregated and fragmented, full of rivers and canals, and extremely polluted. The Olympics accelerated its regeneration. Three different master plans were realized (one for the event, one for the transformation mode, and one for legacy mode) to plan and deliver a new public park and state-of-the-art venues, which are accessible to local communities and all Londoners (i.e. the Copper Box, a multi-use arena, is used by local schools). Another successful achievement was the investment on public transport. Stratford, the main access point to the area, was already well connected before the Games, but it is now reached by two metro lines, some over ground and DLR (Dockland Light Railway) connections, a bus station, and a high-speed train station. Also, one of the aims was also to create a mixed-use district, providing commercial, recreational, cultural and residential areas. Indeed, the Olympic Village was transformed into the East Village, a new community with around 3000 flats, half of them of affordable and social housing, while three universities and other cultural institutions have plans to open new branches in Stratford. Although the Westfield shopping centre was an independent project, not related to the Games, its proximity to the Olympic park and village helped in creating more than 10,000 jobs, many of them part-time and reserved to women, allowing them to manage work and family. In addition, many other commercial and offices spaces are under construction around the park and the metro station. The main issues relate to costs and expenditures, and the management of the Olympic stadium. Regarding the first one, the management of all major events always shows a discrepancy between the planned budget in the bid book and final costs, and London is not an exception in this. An initial overall budget of 9 billion Pound (House of Commons Committee of Public Accounts 2008) was indicated in the bid, while according to many interviewees, the real expenditure reached 24 billion, almost three times the original planned cost. Also, funding the park and its maintenance will be a difficult issue in the future. Greater London Authority committed itself promising sports facilities to be managed by social enterprises and to be accessible to local communities. So, balancing costs and revenues will be a challenging task. Where to collect the funding necessary to maintain the park and its facilities? How much money will be needed to maintain and keep the park and the area and public spaces? GLA will soon have to answer these questions. Besides, the stage of mega sports events always creates inefficiencies, because even in the best cases, hosting cities have to plan and deliver certain activities and infrastructure that will not be needed anymore after the event is concluded. In the worst cases then, white elephants and underutilized infrastructure are what is left once the event is over. These inefficiencies are also linked to the frequent changes to venues and the overall plan. The Olympic stadium offers an example. The evolution of its design has not been straightforward, increasing costs and expenditures. During London’s bid for the games, the government meant to have an athletics only stadium. The original aim was to largely disassemble it after the games, reducing the 85,000 seats to a capacity of 25,000, with the lower tier remaining in place as a permanent athletics facility. However, later on, the government changed the initial plan for a multi-sport stadium. The political dimension/decisions vs. good urban design: often decisions are made not because they are good decisions, or because they can create useful and sustainable legacies, but just because the political power wants it (i.e. city branding and symbolic events as for the cases of Qatar 2022 and Beijing 2008). Temporary vs. permanent: temporary in many cases is better. However, it is still an exorbitant cost: how much does it cost to build and then dismantle a temporary venue? Legacy plans vs. its implementation: it is essential to have the ability not only to design but also to develop and deliver long-term projects. For example, in London, the Olympics were used not only to deliver a spectacular event, but also as a tool/means for accelerating an already existing vision and plans, and the city had the vision but also the capability to leverage this event to regenerate a wide polluted and contaminated area. However, many other countries do not have these capabilities. The post-occupancy evaluation of the Queen Elizabeth Olympic Park revealed important findings about the management of the Games and their legacy. From a governance point of view, the major strengths were the synergy of the Olympic bid with the London master plan, and the strong vision and political willingness to start and achieve a process of convergence and integration of the East London. The transformation of Stratford and the borough of Newham was already planned and it would have happened in any case, although more slowly, especially considering the deep economic crisis of 2008, and the political change at local (change of Mayor in 2008) and national level in 2009. The Olympics have indeed triggered and accelerated this process of transformation. Another successful strategy was the inclusion of a chapter devoted to legacy in the bid book and the founding of a legacy plan and body well in advance and already in place before the beginning of the Games. De facto, the 2012 Olympics gave rise to a change of perspective, putting legacy and the post-event use in the foreground. Firstly, there was a careful planning of the use of permanent, already existing, and temporary venues and infrastructure. Permanent facilities were built only when beneficial to local communities, and the aquatics centre exemplifies this strategy. In addition, three master plans were designed in the planning phase: one for the event, one for the transition mode, during the time needed to transform the park and dismantle the unnecessary infrastructure, and one for the legacy mode. Also, the capability of planning and implementing complex projects, along with the right time management, allowed to have all the venues ready at least one year before the Games, and, in this way, to have time enough to focus not only on the two-week event, but to be able to focus on the post-Games usage. The economic side is probably the most vulnerable. As in the majority of mega-events, also in the case of London the budget presented in the bid underestimated the real costs, and final expenditures almost tripled the initial spending plan. In addition, the crisis of 2008 pushed away all private investors, leaving the state with the task of covering all expenses. This was translated, among other solutions, in a council tax hike of 20 lb per household per year, particularly unfair for low-income families. In addition, the cover of the expenditures for the maintenance of the park and sports venues is another major issue. Also, the cost of managing the event and the competitions, and the cost of ensuring the safety of spectators and athletes was extremely high (security costs were quantified in £553 m by The Guardian 2011). Also, the spectacular opening ceremony cost about £27 m (Interview 4). The environmental impact presents several achievements. Before the Games, the park was an area of 75 ha of polluted and contaminated soil and water. The Olympics allowed reclaim these lands and give a new park and open space to the local communities. For this purpose, an onsite soil-washing centre was built to reduce distance that soil had to travel. In addition, great attention was given to the sustainability of each single venue and Olympic Village. To illustrate, the venues were built to minimise resource use, and the velodrome best shows it, as it was built with 100% sustainably-sourced timber (IOC 2013), and its resource-efficient approach to construction led to £1.5 m savings from the cable-net roof design alone, requiring about 1000 tonnes less steel and embodied carbon savings of over 27% (Department for Environment, Food and Rural Affair 2013). Finally, the site is highly accessible by public transport, another achievement from a sustainability point of view. The Games focused on integration and convergence, from both a physical and a social perspective. The aim for staging the Olympics was to return an open space to Londoners, physically integrating the park with the surrounding areas, and providing local communities with a sense of ownership, pride, and opportunity. The lack of accessibility and the complex topography, made by rivers, islands, roads and railways were overcome with the creation of bridges, and pedestrian and cycle paths. In addition, the provision of mixed-use areas around the park and several means of transportation helped in the process of convergence with Western London. The park was located in a polluted and abandoned area, so the Games did not create displacement; however, the regeneration accelerated by the Games led to forms of gentrification, with an increase in house prices. To conclude, there are ways to optimise the Olympic budget and foster beneficial legacies, and some of them were at least partially utilized in London. For example, the use of temporary facilities that are dismantled just after the event is very helpful, as it helps in avoiding white elephants and maintenance costs. Also, privileging a spread event, by using sports clusters that include already existing venues, is a successful strategy. Private funding and sponsorship should be utilized more and more to cover part of the costs. Plan well ahead a legacy plan instead of retrofitting after the event, as in the case of London, is extremely helpful in avoiding delays and unnecessary costs of reconversion. Also, linking the event to the city master plan, by using the Olympics to trigger and foster the regeneration or redevelopment of entire urban areas can help in prioritizing the budget and reduce the gap between the total Olympic budget and the costs of the legacies. All the Behavioural maps and details of the interviews utilized for assessing the space are available upon request to the author. This research was approved by the Qatar University Institutional Review Board (QU-IRB), with the Approval No. QU-IRB 507-E/15. This article was made possible by GSRA grant # GSRA1-1-1119-13007 from the Qatar National Research Fund (a member of Qatar Foundation). The findings achieved herein are solely the responsibility of the author.